Line Wobbler isn’t how most gamers picture a dungeon-crawler. It’s a long LED strip stretching down from the ceiling connected to a spring-based joystick—more installation art than video game. Its developer, Robin Baumgarten, didn’t expect his niche little project to gain much traction in the gaming community. A physical thing, a few dozen copies of Line Wobbler exist, but its reputation has far transcended the limits of its hardware. Miraculously, since its release in 2014, Line Wobbler has become a tiny sensation. And its only going to get bigger and brighter as Baumgarten moves to make a piece of hardware viral. Baumgarten got the idea for the “wobbler” aspect of Line Wobbler—its spring controller—while watching cat videos on YouTube. In one truly precious and inspired video, an orange, furry paw plucks at a basic spring door-stopper from under his owner’s door. Baumgarten wanted to replicate that, but didn’t find an application until Denmark’s Exile Game Jam in 2014. There, he noticed his friend and fellow game developer Matthias Maschek tinkering with an LED strip. Baumgarten brought him his spring controller. So he programmed a few red dots into the LED strip with an Arduino to serve as enemies. When a player quickly flings the controller back and forth quickly, the green dot emits its attack, smaller green dots on either side of it, which eliminates the red dots. Each level has new challenges, like dodging big blocks of red (maybe, lava pits?). There are ten levels total. “It’s a very pure game. I don’t think you can remove much from it. It’s arrived at its final form,” Baumgarten said. 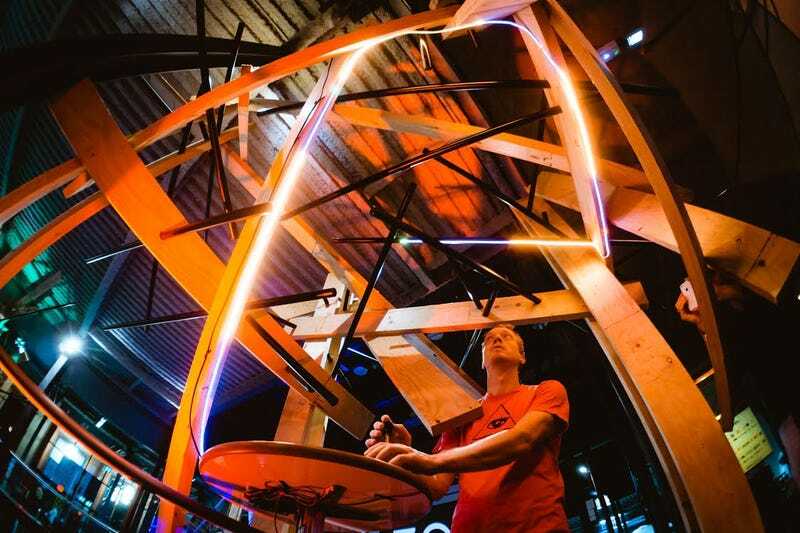 Now, Line Wobbler’s controller is custom-made, and its LED strip is five meters long, sometimes longer. It stretches up to the ceiling, so the game is never entirely within your field of vision, an experience few digital games can replicate. Line Wobbler has been to the Game Developers’ Conference and IndieCade in California, the Tokyo Game Show, Burning Man, EuroGamer Expo in Birmingham, England, and museums on four continents. At GDC, Baumgarten watched as his idols like Tim Schafer played the game. At IndieCade in 2015, Line Wobbler won the Game Design Award. It’s also been set up within a forest and underwater. At each event, onlookers flock to see the glowing hardware. I’ve watched kids pick it up faster than their parents and play for fifteen minutes straight as a line steadily forms behind. I’ve seen it transfix seasoned gamers and developers alike, when every cutting-edge game available is contained in the same room. Against the background of screens, Line Wobbler is a refreshment. I played the game when it was installed at IndieCade East and at a Brooklyn warehouse party called Low Level. Each time, it was like playing one of those brutally addictive early 2000s flash games as a child. I remember sharing a computer with my brother and, even after my turn was up, I’d latch onto the seat like a stubborn animal to have another go on some platformer. The people waiting for some Line Wobbler action behind me probably felt like my brother. But then, when they played, they understood. Line Wobbler could never truly go viral. It’s limited by its physicality. But over a year after it debuted, Line Wobbler hit number one on /r/gaming, with its 13 million subscribers, just last month. Commenters on the behemoth subreddit cracked a few jokes, calling the enemies “flat” or accusing the plot of not having enough “depth.” Several asked for their own kit—something Baumgarten says he’s working on, so bars or festivals can install his game to keep up with demand. Its mix of novelty and accessibility had made it a sensation (or, in Baumgarten’s words, a “curiosity”). Baumgarten thinks the post blew up, in part, because it was about the game’s installation as much as the game. He had sent a museum in Perth, Scotland, a Line Wobbler kit. Around it, they built built a red, craggy path for the LED strip to sit on. Usually, it’s just tacked onto a wall. “It had a life of its own,” Baumgarten says. Its simplicity, perhaps, is why it’s so lovable and works well in a remarkable range of contexts. It’s why it skyrocketed to the top of /r/gaming and why Baumgarten gets several requests from museums and gamers for copies of the hardware each week. Fittingly, the next step for Line Wobbler is to make it less linear. Baumgarten wants to install several Line Wobblers next to each other, making them branch out like a tree. It’d be a different game. He backtracks a little, though, wondering whether Line Wobbler’s appeal exists mainly within its straightforwardness. “There wasn’t that much preconception that went into the game,” he says. “It was an organic process, putting things together to see what happens.” So the one-dimensional dungeon-crawler will evolve organically, he says. He’s given up planning its future.